Bones really shouldn’t be scary. They’re an important part of normal human anatomy that helps keep us stable and sturdy in everyday life. The skull even protects your noggin from serious injuries! And yet, somehow they became heavily associated with Halloween and frightening things. Why do you think that is? Maybe it’s the grim black and white color scheme that it’s always depicted in… yeah! That’s got to be it. If only there was a way to make the human skeleton more appealing. The classic skeleton needs representation during Halloween without being so scary! Perhaps there’s a solution in costume form? Maybe if the human skeleton was in a slightly more snazzy color scheme, then it would be a little more fun and a little bit less frightening. Something with bright blues, neon oranges and pretty pinks! Well, it just so happens that such a costume exists and it’s perfect for your little one. Dress your child up in this adorable infant color bones costume and everyone will start seeing the human skeleton in a new light! The costume is a baby jumpsuit that has blue, green, pink and orange colors printed on a black fabric. The headpiece even has a tiny green skull printed on it. It’s far too colorful to be scary! Just one look at your little one wearing it is a happy occasion! 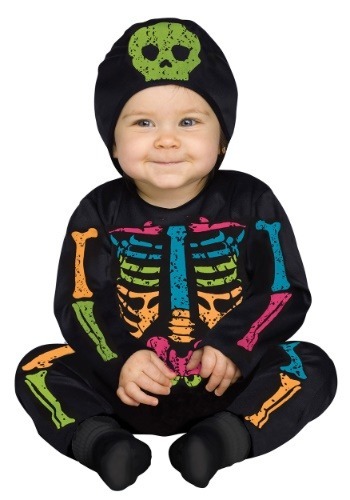 Of course, another great benefit of this infant costume is that it puts a happy spin on the classic Halloween skeleton costume. The original white bones might be a bit too scary for some little ones, while this one helps give your child a classic look, but with a fun, colorful twist! Your little one will be ready for his first Halloween in no time!